Abstract self expressionism strikes again! There is just something spontaneously sporadic about this design that is compels you to look and question the designer’s rationale! Is this a modern masterpiece, a Picasso inspired design, or is this a blatant attempt to be different that hasn’t really worked? 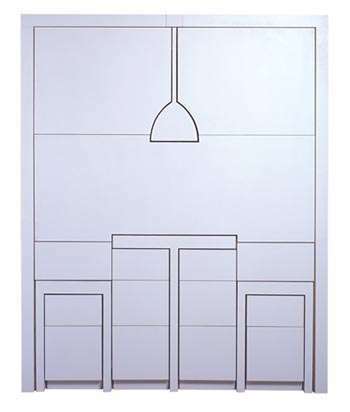 Whatever decision you come to it must be said that the tall wall units to the left of the image seem isolated and strange, temporarily causing the eye to drift from the main body of the design. 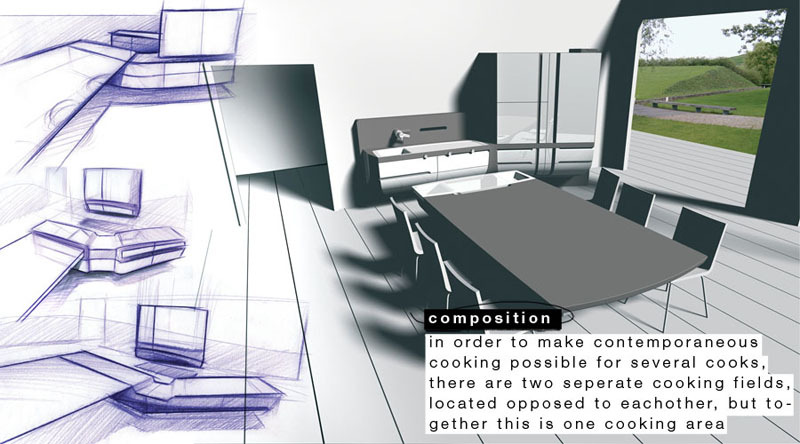 Okay there is allowing the kitchen to be absorbed into the surrounding architecture and there is losing the opportunity to actually have a kitchen! This idea is forward thinking but it could be seen as a little naive! 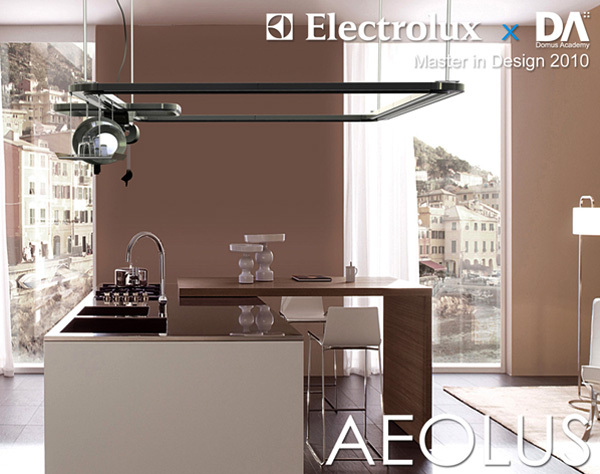 The idea of the kitchen transformer is one that has been explored by lots of designers in many different ways but this particular creation lacks soul. 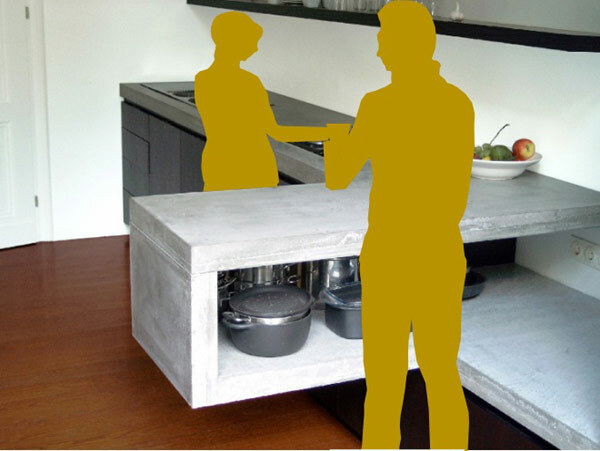 The Mogul can appreciate how this design could be considered to be a piece of contemporary art but feels it might be stretching it a little to actually describe this design as a commercially viable kitchen. Seeing the outline of the kitchen on the wall would eventually irritate The Mogul....if the kitchen is going to disappear into the wall it would be nice not to have such a strong reminder of its presence. The Mogul would even argue that having an island in the centre of the room with transforming elements and subtle lighting may be less obvious than this kitchen, which while in the standby position gives away its position like an elephant hiding behind a daisy! 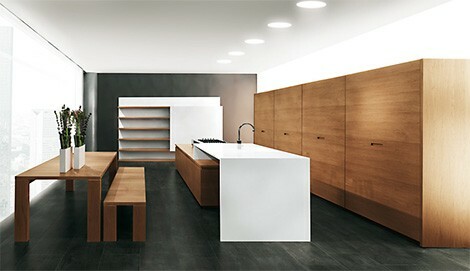 There is also the little issue of creating the architectural void into which the kitchen will slide! It is great to see individual designers trying to come up with new ways of expressing kitchen design and although The Mogul has voiced an opinion, concepts can be fine tuned and become revolutionary. 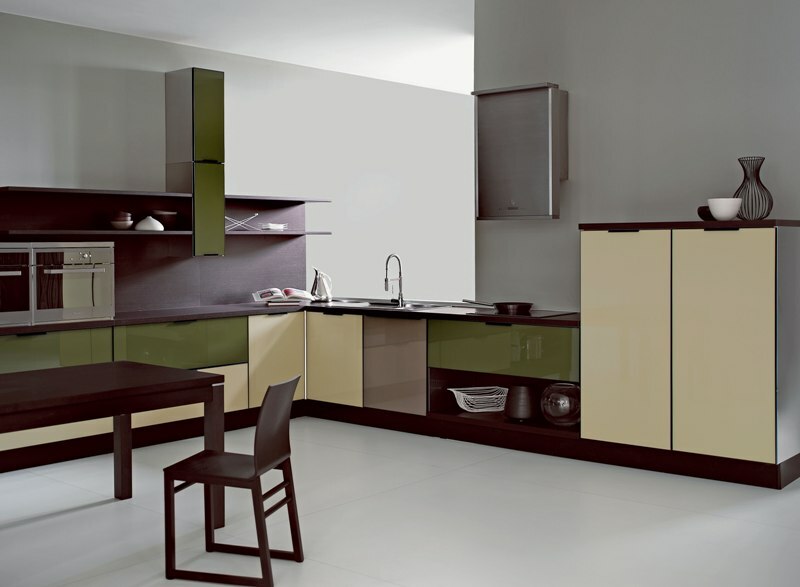 Notice how the kitchen is absorbed into its surroundings as the stronger colours and textures in the foreground dominate the field of vision. 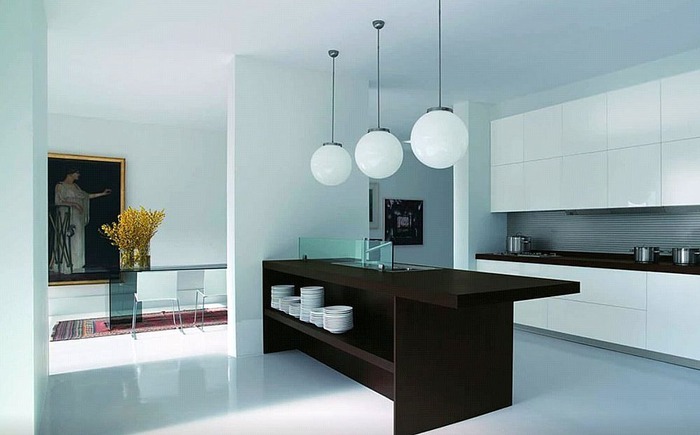 The white kitchen sits humbly in the background, almost insignificant, but providing great aesthetical contrast and balance. 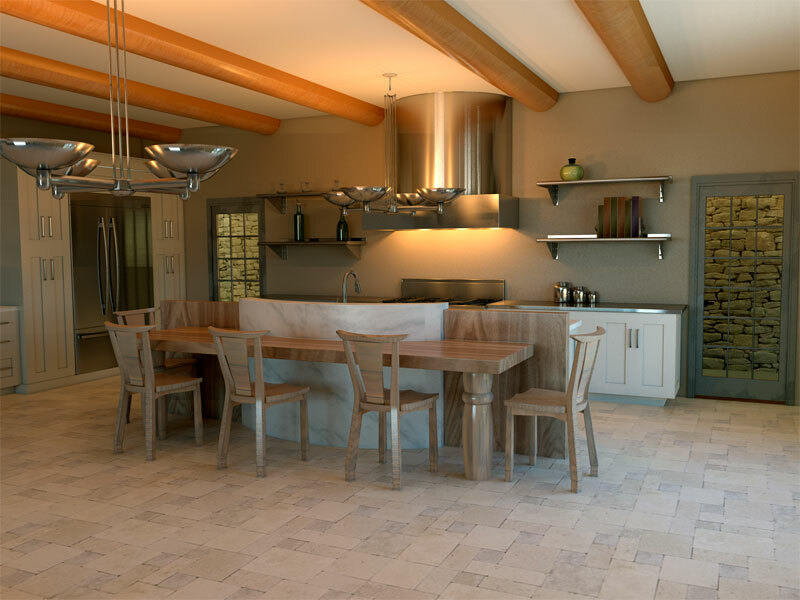 In an open plan space like this it is vital to consider what impact the kitchen will have whilst sitting in the “standby” position. Great renders – we are entering a virtual World...or is the KBB industry already there? It was only going to be a matter of time until The Mogul decided to comment on one of Philippe Starck’s creations for Warendorf. The Mogul’s initial reaction was to dismiss the range as a grotesque celebration of ego, an example of the industry bowing to the power of one individual, and embracing the control of a celebrity designer. And yes, this range is guilty of putting Starck on a pedestal, enabling him to loom over other less celebrated designers who create change and industry drive on a daily basis, and are using more humble budgets to do so. 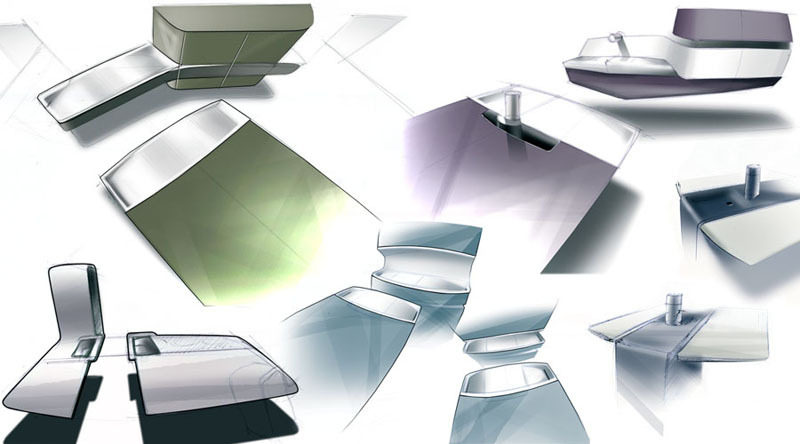 But you do have to appreciate Starck’s skill as a designer. There is real depth to this design and he is obviously a keen observer of the industry, either that or he is able to take advice well! His range could be described as a selection of “unfitted kitchen pods with a flamboyant sprinkling of eccentric”! Aesthetically there is a drive to be unusual, a blatant effort to be “designer”; and this element of the concept certainly ticks all the right boxes for many. The exclusive looking trumpet legs work brilliantly adding design flair and hiding the island services in a dignified way. 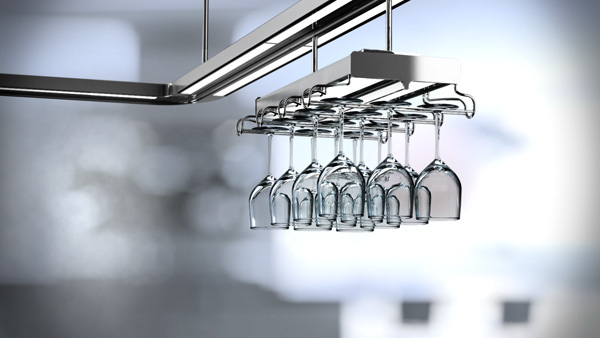 The appliances can be hidden behind doors, aesthetically neutering the functionality of the kitchen and allowing it to become the centre piece of any home. Special motors have even been included that dissipate residual heat from the ovens so that the door can be closed immediately after use. 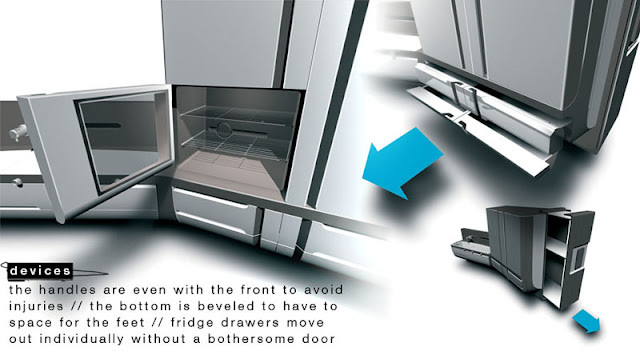 One thing The Mogul is unsure about though is what happens to the tall “oven modesty” door whilst the ovens are actually being used, does it protrude into the room causing an obstruction or does it neatly slide into a pocket only to be pulled out when cooking is finished? If this design is pocket-less it could easily loss points on the functionality front and the number one rule of kitchen design will have been broken. Overall though this is a great design and it shows why Starck is still seen to be at the top of the professional design ladder. You have to appreciate the aesthetical quality of this design. It sits as a modern monument to contemporary style. The most striking and original element of this design is the slender white worktop which sits at a reassuringly ergonomic height, assisting in food preparation and cleaning. 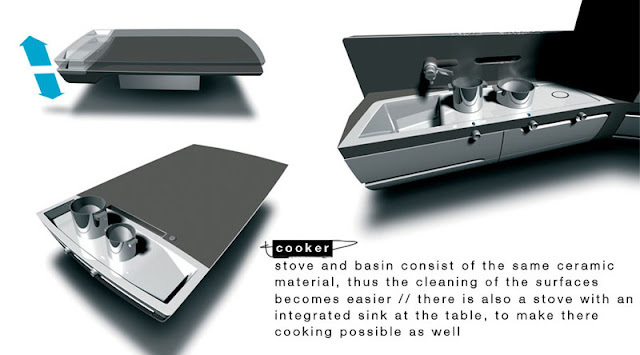 It is interesting, if not a little disappointing to see that the designers have used a big solid casing beneath the sink to conceal the wastes and offer some support to the wafer like work surface above. The Mogul can imagine other ways of doing this! It is also interesting to see that the cooking zone is set at a slightly lower level than the cleaning zone. The layering of the surfaces here is great, giving the design an artistic presence and allowing the user to mix up the cooking experience. Although not a fan of having so much worktop at a low level The Mogul appreciates that this area can still be used to accommodate large electrical appliances and non-consumable items used in food preparation. 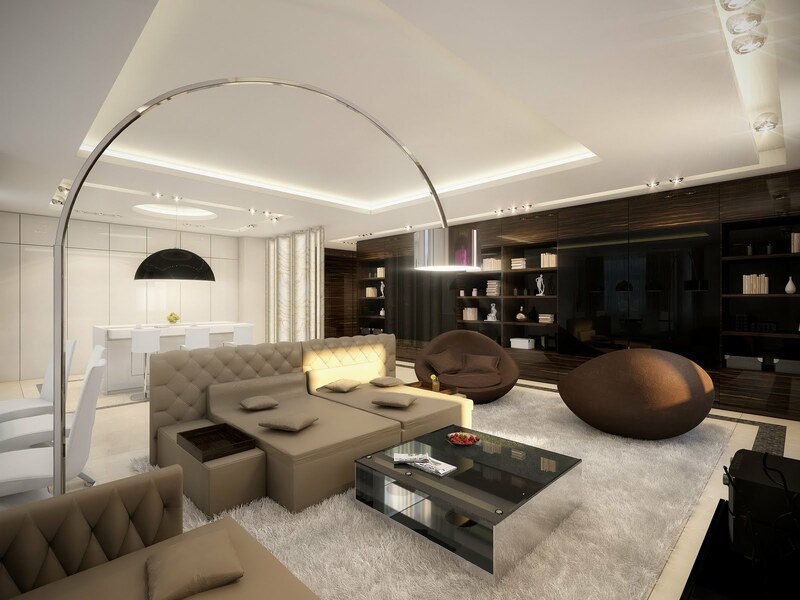 This is a lovely design and only the client can decide if the functionality suits their needs. The Mogul can see where this design is going and what is trying to do but unfortunately no one will ever buy it. From an artistic stand point the design must be given a fair hearing as it is different, abstract and demands our attention but would the average customer want to live with it? 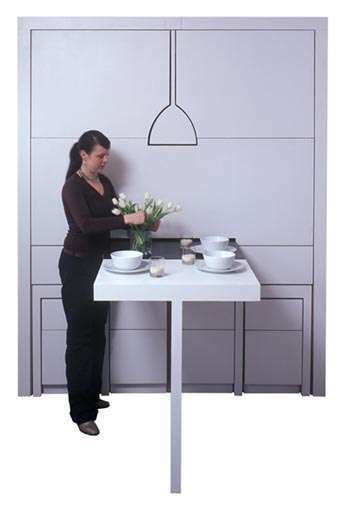 This kitchen could easily have been assembled from a collection of left over panels that the manufacturer wanted shot of. 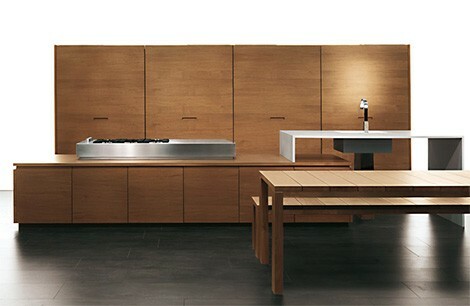 The Mogul calls this design “The Emperor’s New Clothes Kitchen”. In the beginning everyone will gather around amazed at the bold design but in the end the client will realise that there is little substance in the design becoming nakedly exposed to criticism of their choices! There is just something lacking here, maybe the panels are too large, too uniform or maybe it is just The Moguls subjective opinion that is blurring the concept. The Mogul always prefers to be adorned with mask, cape and spandex suit when going out and does not like the idea of going out naked even if it is in the name of design! The kitchen is becoming more focused, precise and calculated in every way. Designers have released it from its traditional architectural confines and are presenting this functional furniture in a new light. The Mogul loves this design as it is determined to keep our attention on the task at hand with short walking distances between functional zones playing a key role in this concept. 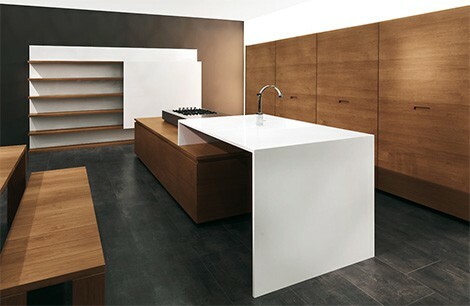 This is not just a square island; it is a kitchen that considers ergonomics, functionality, sociability and natural light. It is a design that appreciates how layers and voids can make simple shapes interesting, user friendly and artistically influential. 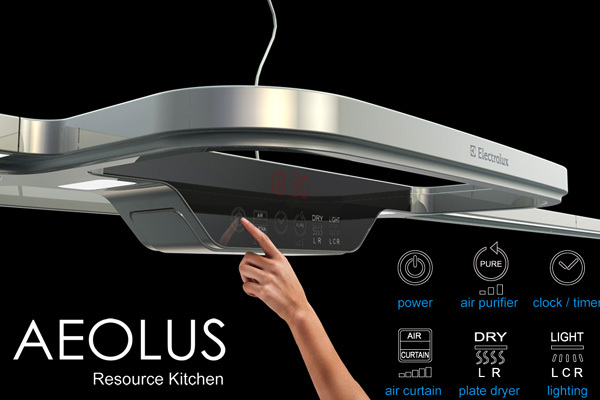 The dropped ceiling and significant canopy only act to focus our attention on this axis of domestic life. 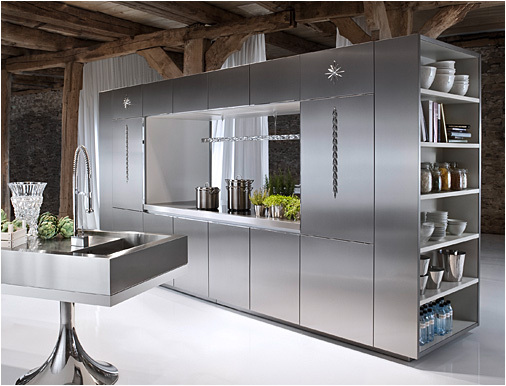 This design is the dot on the "I" of the word kitchen – punctuated, and deliberately influencing the surrounding environment. This is a very clever concept with complex layers and it should be appreciated! The Mogul always appreciates something new and this concept certainly causes us to rethink things a little. 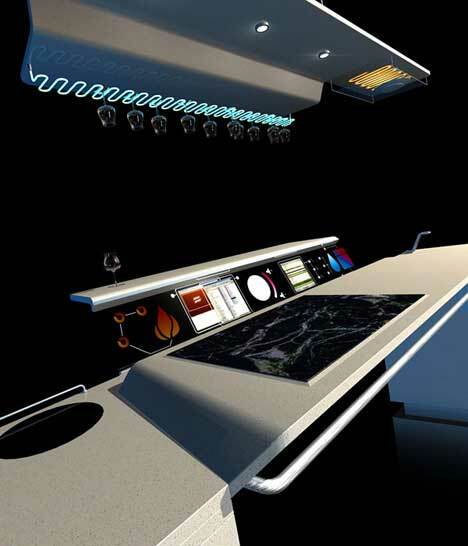 This compact and functional kitchen would be perfectly suited to the interior architecture of the Star ship Enterprise or would be the perfect functional prop on the abstract stage set at a Pet Shop Boys concert. However just like Electropop this kitchen will not be universally accepted, instead it may find a limited following of open minded, artistically influenced individuals who may wear base ball caps and futuristic clothing! Our approach to everything must change for this design to become main stream. 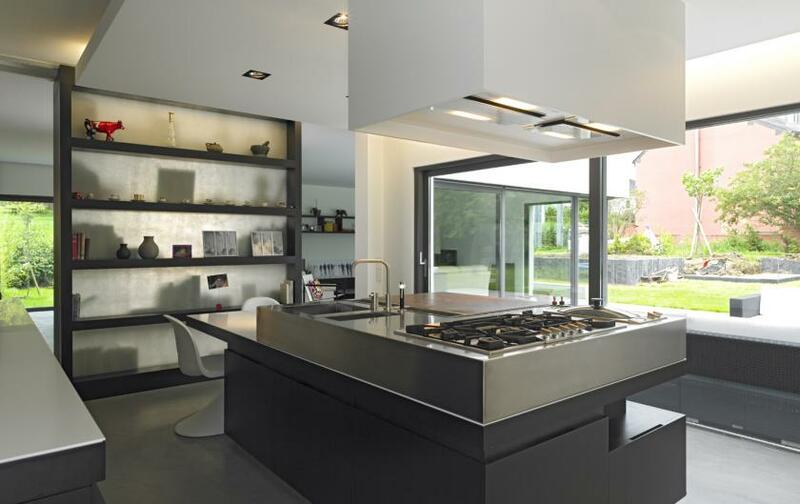 When it comes to functionality, mathematical precision, artistic expressionism, architectural influence and sociability you will find that good kitchen designers have it covered! It is therefore only to be expected that the next step for this band of intrepid designers is to defy Mr Newton and gravity itself! 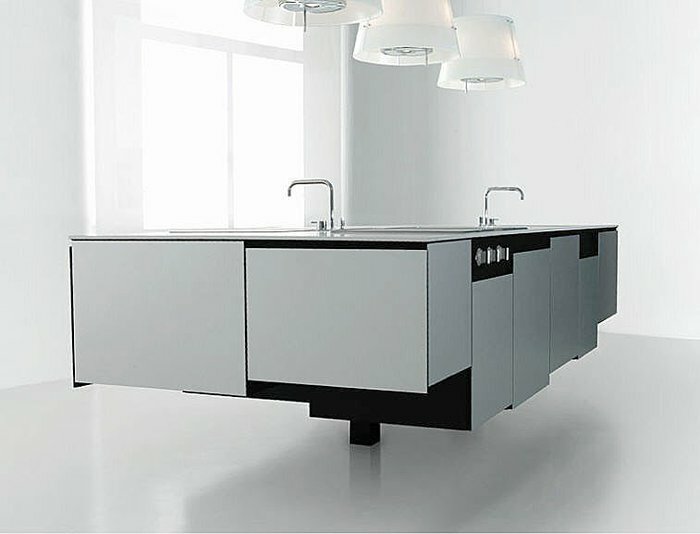 This abstract design gives the cabinetry freedom of movement on the vertical plane giving rise to a personally defined clustered structure under the worktop! 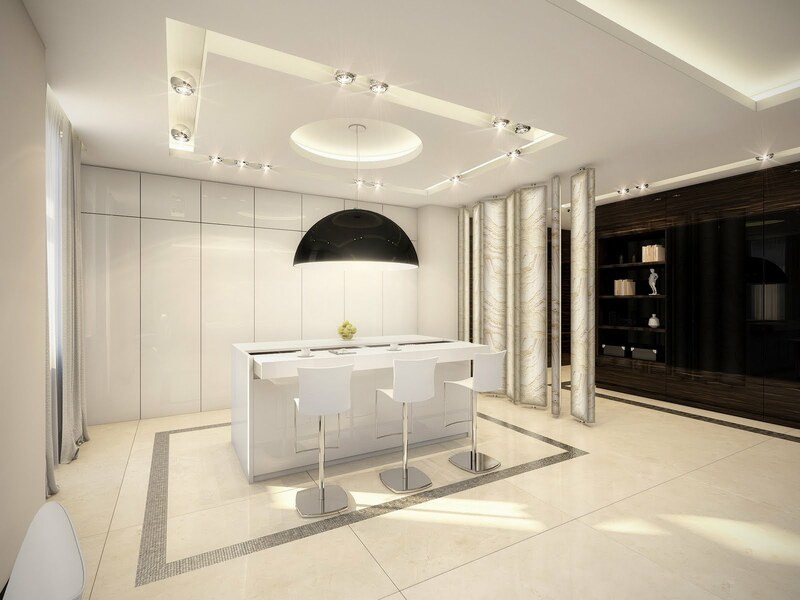 This design is a virtual vision, a glimpse into what can be achieved when you have a disciplined, fertile imagination that has been honed to deliver functional satisfaction and aesthetical pleasure on many levels. 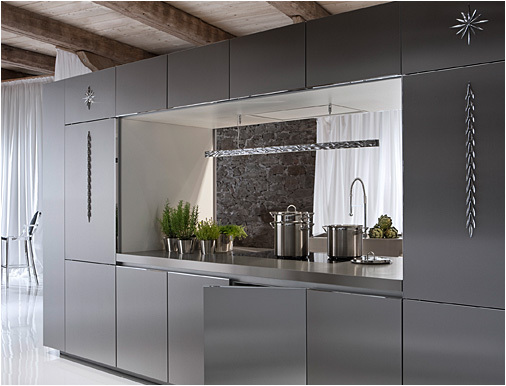 It is an example of what can be achieved when you employ a great kitchen designer. So you should hire Paul Anater then, the creator of this concept! The Mogul was drawn to this design because of its softness and warmth. The colours and textures run into one another in a way that soothes the eye, inviting you to get tactile, placing your skin on the various elements that make the design different. But you won't be touching this kitchen anytime soon! The feature curve on the island that doubles up as a splash back is the hook in this design; offering femininely curved modesty to a cleaning zone that has potential to embarrass from time to time. The island curve has been emphasised further by using a custom hood with a matching radius over the cooking zone and the stage is set by the wall units bowing out gracefully to the minimal, “cook’s kitchen” shelves! 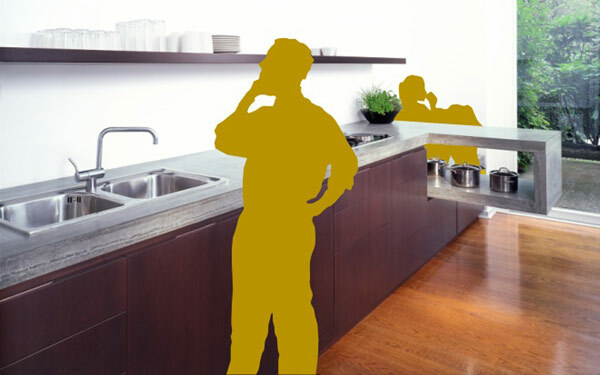 This design was never actually manufactured; it was created as a virtual brief solution for an outdoor kitchen for the website www.kitchens.com. Amazing work! This concept creation by Robert Lange celebrates the idea that the kitchen is a social hub, allowing people living in a communal environment to interact socially while preparing independent meals. The space is also versatile enough to adapt to changing communal demographics. 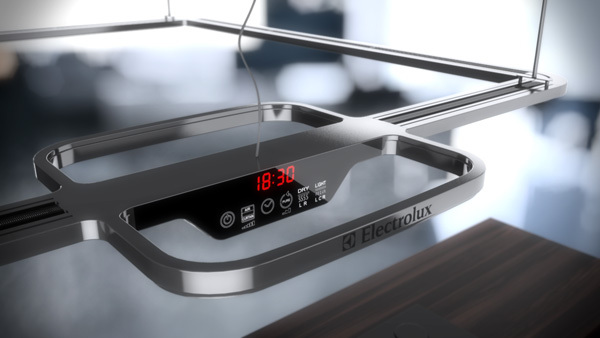 Many kitchens now feature duel cooking and cleaning zones in order to aid work flow and function but it is interesting to see this idea adapted specifically for a “flat share” situation. 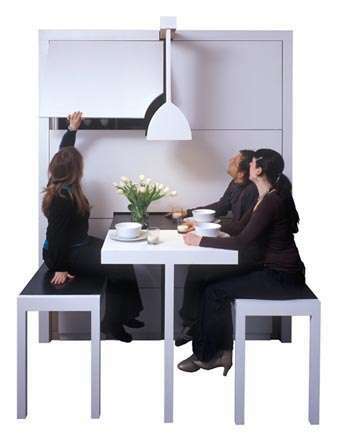 Maybe in the future we will all be forced to reconsider our living arrangements and these social pressures may remould our expectations of the kitchen. 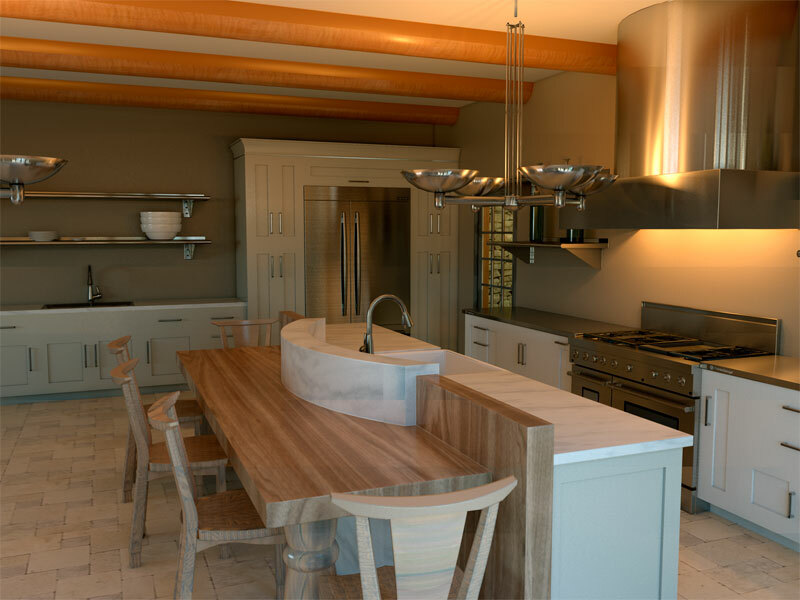 Within kitchen design human and social elements dictate the equilibrium and influence the pace of change...we have interesting times ahead! This design is so clean and fresh; it is not over designed and radiates an air of quiet sophistication that requires appreciation. The architecture and decor are permitted to envelop the units along the back wall which have been embroidered with a delicate but mathematically precise matrix. The similarity of colour used here fuses all of the design disciplines together allowing the contrasting island to stand out as a significant feature. The island looks natural, man-made, as though it has been crafted by hands who appreciate traditional woodworking techniques. But the lines here show that this island has been spawned from a mind with contemporary vision and an appreciation of the purity of simple forms. 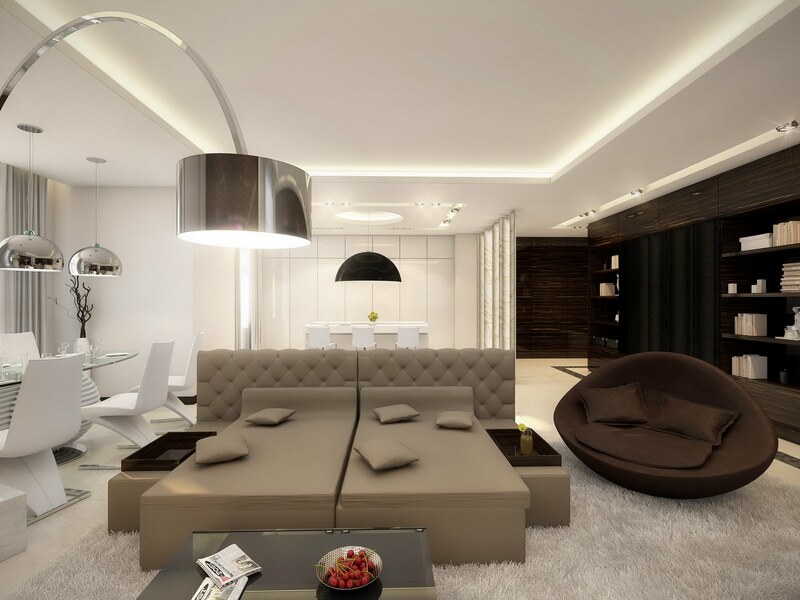 If space is tight you might want to consider something like this as the “hub of your home”. 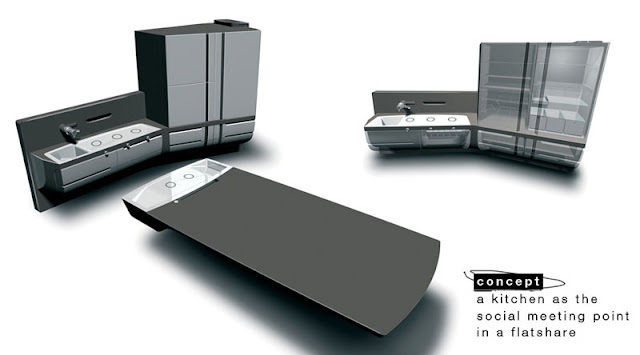 This futuristic kitchen transformer offers function, sociability and style in equal measure. The texture and colours of this progressive concept give it a soft appearance, almost foam like! Very child friendly! 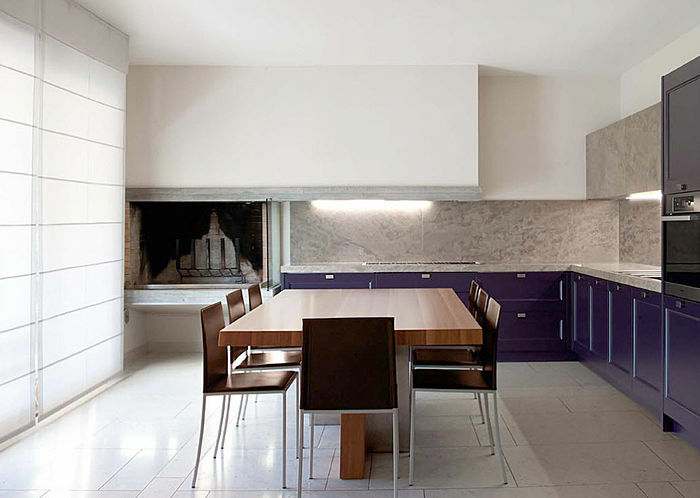 This is yet another example of how the kitchen has become detached and removed from the surrounding architecture. The kitchen can now be defined as an island. 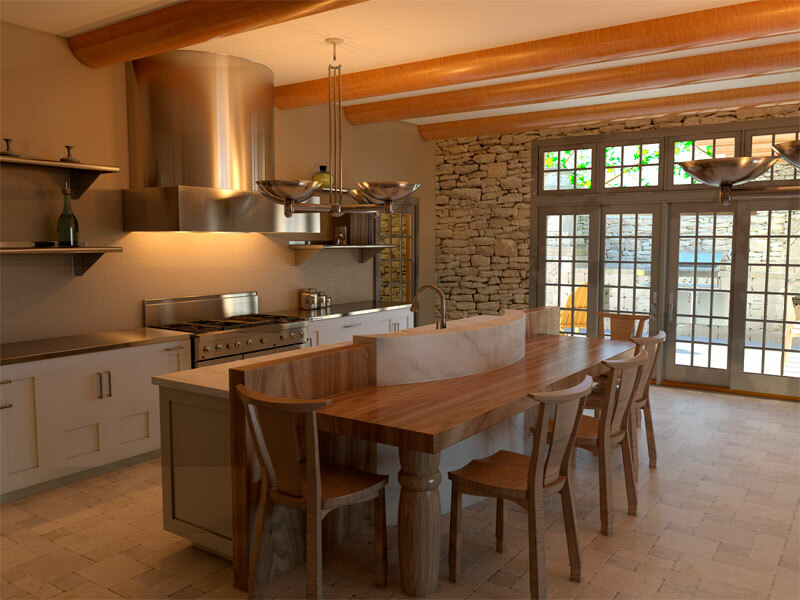 Traditionally the kitchen was imprisoned in the corner of a room, but now, with the help of forward thinking members of the design community clients are learning to celebrate the beauty of this important functional furniture! 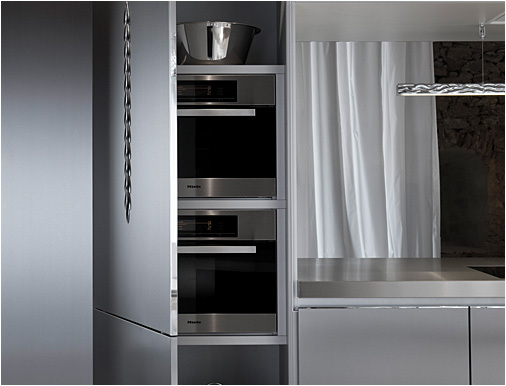 The modern kitchen is now placed centre stage in our domestic drama! Having the main player transform at the whim of its user only adds to the experience, offering animation and giving the design the required wow factor! The Mogul loves this image because it is challenging! 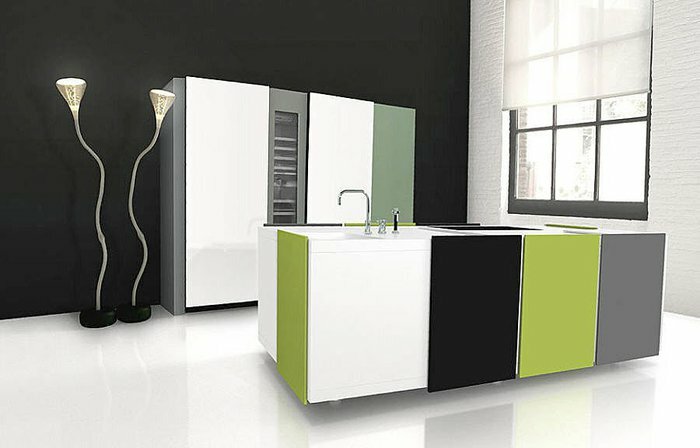 The linear lines of contemporary kitchen design and mainstream commercial colours have been abandoned; instead there is a celebration of individual taste that embraces colour and form! 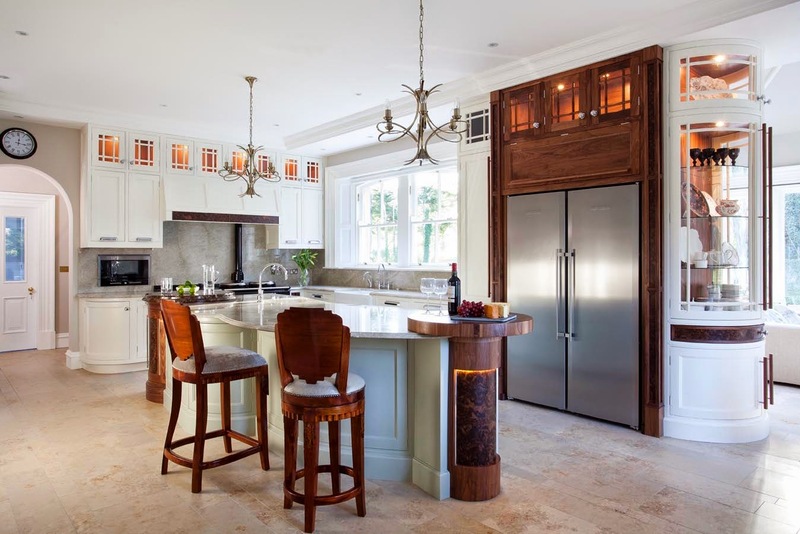 Is this an example of how functional kitchen art expresses an island and can this one individual style indulgence define the entire kitchen, the architecture and the people who use the space? The answer you are looking for is yes! This kitchen is huge; it meanders around the room throwing its weight around, casually placing functional elements here and there; it could even be said that this particular design rambles a little too far! But there is a natural gravitation here towards the exceptional island which acts as a functional anchor drawing the hungry towards the source of nourishment! 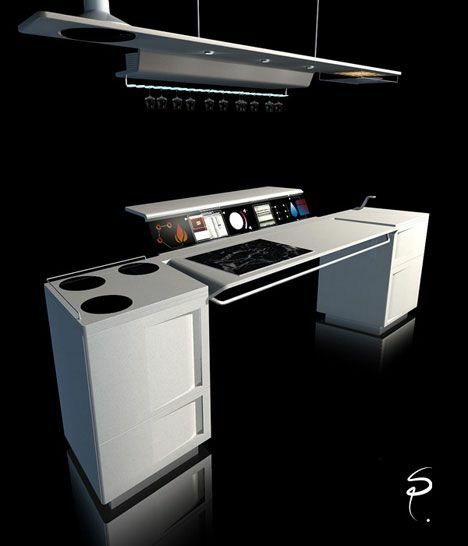 And there is no better way to impress your salivating guests than by serving something hot straight out of your super cool Scholtes appliances! 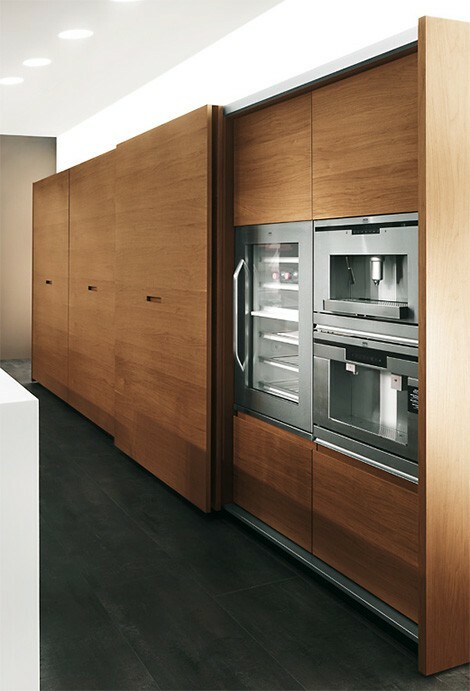 The mixture of stainless steel and chocolate is great presenting a vision of contemporary elegance and style, but it is the cooking area that gives this design an edge! The format of the bridged cooking zone and the hood resembles a scene from Forest Gump when our unlikely hero runs past some snow capped mountains that are perfectly mirrored into a crystal clear lake...the lines here are equally as impressive! So as you open one of these chocolate doors you really might not know what you’re gonna get!! Shrimp?